Remember how excited you would get as a kid when your mom would tell you that you were having pancakes for dinner? Imagine giving your party guests that same excited feeling. Well, great news — you can with Lil Chip’s Pancake Truck! If you’re wondering what you have to do to have delicious pancakes brought right to your door, we have all the answers. Once your date is confirmed, we’ll need a 50% deposit upon booking and a final head count one week prior to your date. We will, of course, need a safe place to park the Lil Chip’s truck — a driveway is ideal. However, we can also park in your backyard if the ground is level enough, but if we do, we aren’t responsible for any damages to your yard, septic tank, or sprinkler system — sorry! If you’ll need us to park on public property or somewhere without a driveway, we’ll need to discuss logistics with you before your event. 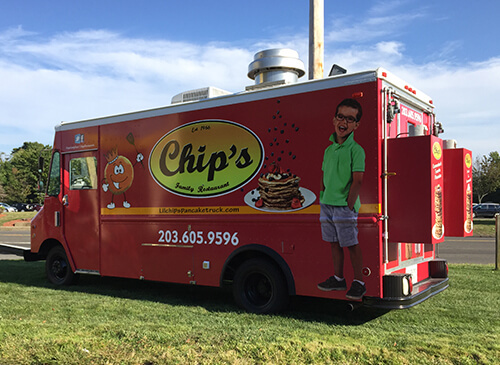 Lil Chip’s Pancake Truck offers several different packages to meet your individual needs and budget. All of our packages include our award-winning buttermilk pancakes, a protein, juice options and a number of delicious toppings. You also have the option of adding syrup, toppings, and egg add-ons for an additional cost. The specific details of each package and the available add-ons can be found on our website! Chip’s Family Restaurant serves breakfast, lunch, and dinner to customers in Fairfield, Orange, Southbury, Trumbull, Wethersfield, and our newest location, Southington, Connecticut. All our meals are homemade, breakfast is served all day and we use local fresh produce. To visit one of our locations or view our menu items, please click on the tabs above.